To ensure that their soccer players could train and compete on high-quality pitches even in winter, 1. FC Köln turned to Rhenac GreenTec AG for an innovative turf exposure system that the company has developed over many years in a joint research project with the Technical University of Munich. 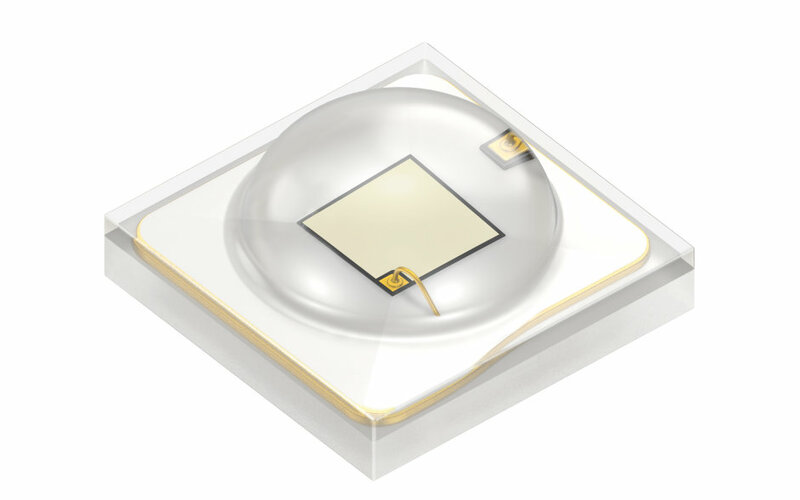 LEDs from Osram Opto Semiconductors are integrated in the system which promote grass growth by supplying the light that is missing in the dark winter months. The light sources used here are the energy-saving Oslon SSL LEDs in deep blue (450 nm), hyper red (660 nm) and far red (730 nm). They are therefore ideally matched to the spectral range required by plants, which mainly need blue light (around 430 to 490 nm) and red light (around 640 to 780 nm) to produce energy through photosynthesis. The LEDs can be adapted to very different ambient conditions and lighting requirements because they have a variable light spectrum and fully adjustable electrical heating units. Thanks to a special function for maximum intensity, the amount of light can be boosted to six times the normal level for problem areas such as the areas in front of the goals, with greatly reduced energy consumption overall compared to traditional systems. The mobile system is being used to treat the grass at the Franz Kremer stadium and also at the training facilities at the RheinEnergieSportpark – not only with the necessary light but also with heat from infrared systems to replace the lack of warmth from the sun. This targeted exposure to light and heat makes the grass grow and closes any gaps in the turf. The playing surfaces are being used every day and have to be maintained in top condition to encourage accurate passing and reduce the risk of injury due to bare patches in the pitch. Since 2015 several Bundesliga clubs have tested Rhenac GreenTec AG’s turf exposure system. Last year 1. FC Köln invested in a mobile Rhenac exposure system and this year Rhenac is constructing the first fully automatic system that will be used for FC Schalke 04. This project was realized with LEDLightforyou, the network that brings together customers and LED lighting solution partners from all over the world. The network has a broad spectrum of expertise to provide optimum support for any LED lighting project.